Prompted by the previous post on the working techniques of Hokusai I have been reading up on the techniques used in Japanese colour wood cut printing. One of the English language references that describes it clearly is a book, here, which is a web version of The Technique of the Color Wood-cut by Walter J. Phillips published August 1, 1926, by Brown-Robertson Co. Inc. (New York). Walter Joseph Phillips (1884 – 1963) was an English-born Canadian painter and woodcutter, acclaimed as one of Canada's most famous printmakers and for popularizing Japanese style colour woodcuts of Canadian scenes. The block-cutter pasted the drawing face down on a polished plank of mountain cherry wood. (Those who have heard that wood engravings are cut on the end grain of box-wood or maple must not confuse that process with this. Cherry wood is cut plank-wise: with the grain and not across it. The thickness is, roughly, one inch). He scraped away the superfluous thickness of paper, and oiled the remnant in order to render it transparent and so clarify the drawing. With a knife and a gouge he cut away the portions of wood uncovered by the drawing to the depth of perhaps one-eighth of an inch, so that eventually he had a facsimile of the original drawing in reverse in wood and in relief. He brushed over this a black powder pigment ground in water, and finally a little paste to bind it. Damp paper was superimposed and the back of it rubbed with a baren (a pad covered with bamboo leaf). An exact reproduction of the original drawing resulted. 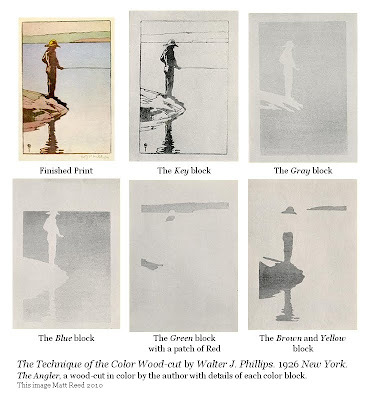 He pasted this on the other side of the cherry-wood block, and as before proceeded to lower that portion of the surface which in the finished print would be void of a certain color. 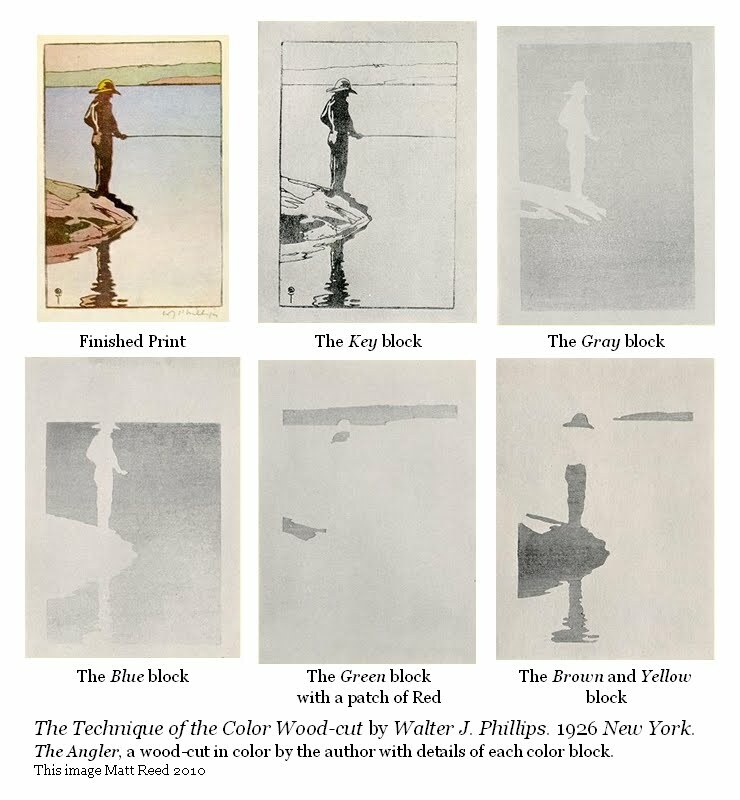 A second print was taken from the first—the key-block—and pasted on a second block of wood, which he cut for another color. And so the process continued until all the requisite colors were accounted for, ten or twelve perhaps, when a second craftsman, the printer, took charge. The finished print was made up of impressions from each of the blocks dealt with successively. The system of making the several blocks fit, or of registering them accurately, is described later on. This book, and the website, includes an image of a finished wood cut by the author and images of impressions from the wood blocks used for the separate colours. I have used these images to make the following small multiple showing the technique. The War on Cancer - the first 40 years.